Note: the definitions in Ports.h were incorrect for the JeeNode Micro. 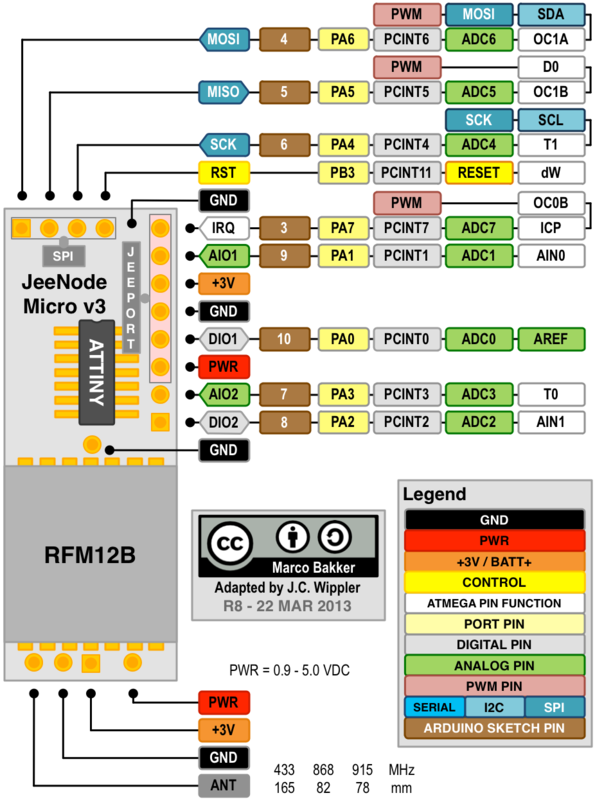 Please make sure you update to the latest version of JeeLib if you intend to use the Port or PortI2C classes with the ATtiny84 on the JeeNode Micro! The thing with diagrams such as these, is that they are hampered by file format wars, with all full-featured drawing apps going out of their way to lock people in. In this case, the diagrams where created by Marco Bakker in Visio on Windows – which I don’t have – so I imported it into OmniGraffle for Mac – which is in turn useless on other platforms. Luckily, PNG and PDF have become de-facto standards which every browser knows how to display – so rendering the diagrams at least produces results everyone can use. Maybe one day, we’ll all be using SVG editors. There’s a web-based one called SVG-edit, but it doesn’t seem to be quite there yet w.r.t. importing the SVG from OmniGraffle. There is also the multi-platform Inkscape, which does import the SVG very nicely (just one minor font size issue, as far as I can tell). But the UI is a bit quirky on the Mac, since it has to conform to the XQuartz conventions of the X.Org X Window System (aka X11). I’ve updated the Pinouts page on the Hardware wiki to include these new Quick Reference Cards, and have attached the design and output files in different formats.